Soursop is a spiky fruit on the outside, but inside, this exotic superfood packs a delicious punch. 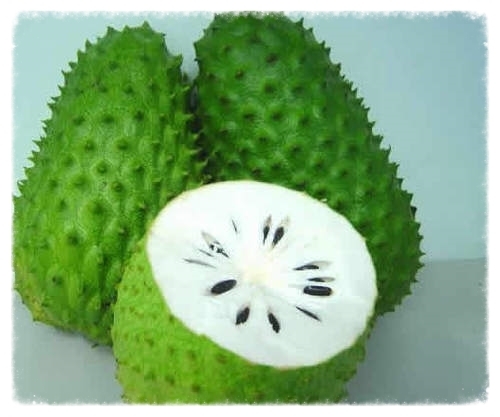 You might have also heard it called "graviola", "guanabana," "soursop," or even its scientific name, annona muricata. It's native to many tropical countries. The tree and fruit are well known in these tropical areas to have extremely good benefits for your body. Soft, sweet, and refreshing, guyabano is a tropical delicacy. It tastes like a mix between apples and pineapples, with a little bit of banana thrown in (for good measure). How Do I Eat It? However you like! Peel away the skin and eat the soft, sweet inside of the fruit, use the leaves for an herbal tea, consume it in supplement form, or...drink it as a juice. The secret to Soursop's fruit - Acetogenins – The leaves, stem & bark of Soursop contain acetogenins are known to fight abnormal cell growth. Research is underway to further investigate the potential link between consuming guyabano & destroying malignant abnormal cell growth. Antioxidants – Research has shown that antioxidants help neutralize the formation of free radicals. In particular experts say that Vitamin C is one of the safest and most effective antioxidants out there. You can find approximately 215% of your RDI (Recommended Daily Intake) eating one guyabano. Fabulous Fiber – This fruit is a good source of fiber that aids with digestion. One guyabano on average contains 85% of your RDI. Combine this with a low-fat, well-balanced diet for a healthy, happy body! Potassium - Studies suggest boosting your potassium intake and curbing salt and sodium can slash your stroke risk by 21% and may also lower your odds of developing heart disease. Potassium works by protecting blood vessels from oxidative damage and keeps vessel walls from thickening. Guyabano is known as the "Miracle Fruit of the Tropics!"